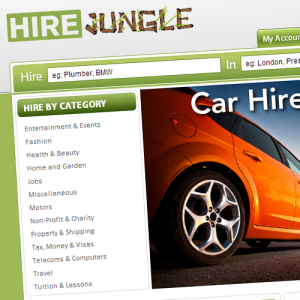 Hire Jungle is a new peer-to-peer platform that allows either businesses or individuals to hire out both goods and services. Listings are free to post and concept has been touted as game-changing. This London-based start-up simultaneously displaying search results for both products and services, allowing users to properly determine their best choice when it comes to either hiring skilled workforce or finding the right products to do it themselves at a cheaper cost. informed decisions when searching for the most cost-effective solution. Users have the ability to list their goods and services at no cost in any of the categories, for example, ‘hire electronics‘. Hiring contracts are then formalized between the owner and the hirer, with no participation from Hire Jungle, which only provides the connection interface between the two parties. Commission-free transactions and publications are some of the core values the new start-up promotes. Hire Jungle addresses the concern of possible damaged or lost items by encouraging owners to request a deposit on all items that are hired out. A sample hiring contract is provided so those users who are hiring out their items can operate safely. No pre-payments are required for securing transactions. Owners’ emails are not disclosed for privacy purposes. Interested hirers are required to fill in a form in order to place their enquiry, and owners will review all forms before getting in touch with potential hirers. Two main categories are available – one for products and one for services. Users of the site can publish free classified ads to promote their products or services respectively. Searches can be completed by browsing categories or by using the powerful search bar found on the top menu. Product and Services categories are linked in a fashion that ensures relevant search results, displaying the services classifieds on the left-hand side and the products classifieds on the right. For instance, a search query for “builders in London” will not just display results for the builders’ services available in that area, but also building-related products such as drills, ladders, screwdrivers, just to name but a few.